We’ve been scratching our heads recently, not just each others, but our own. When Andrew booked for this production of Joe Orton’s Loot (1965) it was because someone – we know not who – promised that we needed to book early because it would sell out when an an all-star cast was announced. Phil once had the thrill of witnessing a sofa collapsing during Shaw’s yeast infection play Candida. He can’t remember which of the cast members proved too heavy a burden for said furniture, it could have been Deborah Kerr, Denis Quilley or Patrick Ryecart. Unlikely that it was Maureen Lipman as she played the maid and hired help generally do not get to enjoy the furnishings. It must have been a gloriously accident prone run as apparently her skirt fell off on another occasion. The National’s Christmas show this year sees the The Magistrate coming off the subs bench to fill in for the cancelled The Count of Monte Cristo. And how fortuitous this proves to be as the Whingers have learned – among other things – that The Krankies’ genius draws inspiration from no less a talent than Arthur Wing Pinero. Was it a cigar or a phallus? Edna Welthorpe (Mrs) would not have enjoyed the post-show discussion following the Whingers’ visit to the Vaudeville Theatre to see a preview of What the Butler Saw for the Whingers found themselves mired in struggles to recall the ins and outs of Winston Churchill’s private member vis a vis the Lord Chamberlain. The Broadway Bellyachers’ last show on The Broadway was Ken Ludwig‘s “howlingly funny” (Time Out New York), “hilarious” (New York Post) Lend Me A Tenor. It came highly recommended by real people too, but most promisingly of all Charles Isherwood dissed it and so far his opinions had proved to be the very anti-matter to our opinions (which are clearly therefore the ones that matter – see what we did there?). What’s on in St Petersburg? Andrew popped over to St Petersburg last weekend to check out what was on. Not to actually see anything, obviously – just to look at the posters. This one caught his attention. It seems to have 10 production photographs in it which is quite an achievement in a poster. It’s probably a farce judging by the buttocks. And it would seem to feature the cast taking their curtain call. All most curious. At a guess, this was Vladimir Mashkov’s staging of Ray Cooney’s popular comedy No. 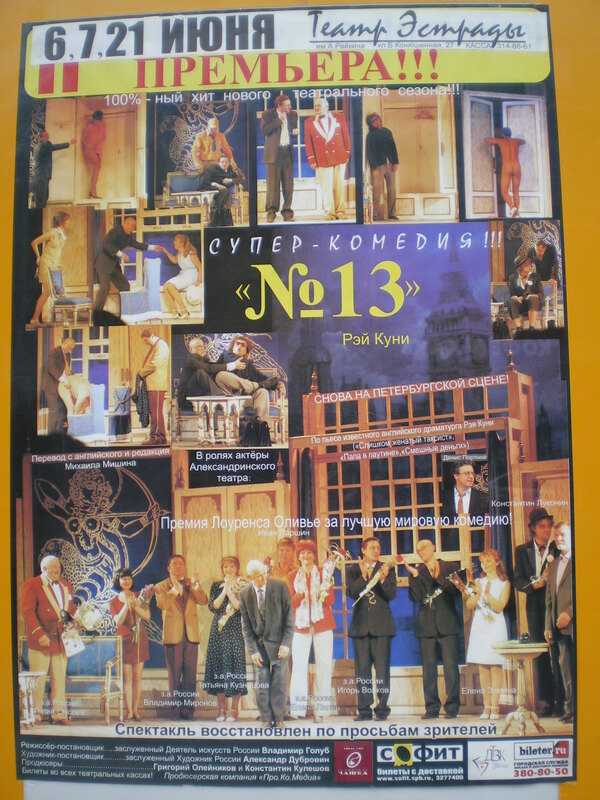 13 starring Avangard Leontyev and Yevgeny Mironov at the Chekhov Moscow Art Theater. But what a lot of words! Translation please, Mr Morrison.